Mark Giordano is Director of the Program in Science, Technology and International Affairs, the Cinco Hermanos Chair in Environment and International Affairs, and Associate Professor of Environment and Energy in Georgetown’s School of Foreign Service. His research focuses on natural resource issues, particularly water and land, around the world but especially in Asia and Sub-Saharan Africa. His teaching challenges students to think differently about water, the global food system, and the interrelationships between science and international affairs. Mark also works as a Doyle Faculty Fellow to create inclusive course content and as a Fellow in the Global Future(s) Curriculum Studio to transform undergraduate education. He is a member of the Georgetown Environment Initiative and a founding member of Georgetown’s India Initiative. Prior to joining Georgetown in 2013, Mark was a Managing Director of the Sri Lanka based International Water Management Institute, winner of the 2012 Stockholm Water Prize. He was a trade economist with the U.S. Department of Agriculture’s Economic Research Services in an earlier career. 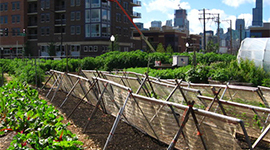 This podcast shares a new perspective on how urban gardens interact with urban communities.